The state House passed a bill to let anyone give tattoos, even without training, but it died in the Senate. Here, tattoo artist Billy Whitney inks Marine Cpl. Chris Sullivan at 808 Tattoo. Hawaii tattoo artists claimed victory yesterday for the safe and professional marking of the human body. After hearing their protests, state senators decided to kill a measure passed by the House that would have deregulated the tattoo industry, allowing anyone to make tattoos, even without training. Tattoo businesses said they were worried that hepatitis and other diseases could be spread by artists who use unsanitary practices. "I was dumbstruck when I heard about this. Unprofessional tattoo artists could come into Hawaii and put everyone at risk," said Florence Batlle, owner of Queen of Pain tattoo parlor in Waikiki, who has a Polynesian tattoo of a dragon on her arm. "It's really scary." The bill would have repealed Hawaii's licensing procedures and safety requirements, opening up the industry to competition from unlicensed tattoo artists. The measure had been pushed through the Legislature as a way to allow tattooing at trade shows and conventions outside of traditional tattoo parlors. Rep. John Mizuno (D, Alewa Heights-Kalihi) pitched the proposal on behalf of one of his constituents, Jas Pascua, senior producer for the Hawaii Big Boys Show. The measure was taken off the agenda until next year, said Sen. Rosalyn Baker (D, Honokohau-Makena). It had been scheduled for a vote today before the full Senate. "The bill is ... probably not in the best interest of consumers," said Baker, chairwoman of the Senate Ways and Means Committee. "After hearing from a number of practitioners, it needs more work before becoming law." The state Health Department had testified in favor of the measure based on research that showed no evidence of disease outbreaks due to tattooing, except perhaps in prison settings, said Larry Lau, deputy director for environmental health. "Tattoo kits are being sold on the Internet, and we suspect that there is unregulated tattooing going on, but we haven't received reports of any significant disease outbreaks or infections," Lau said. "Our efforts would be better spent on food safety issues." Tattoo artists still would have been required to register with the state, but they would not have had to pass a government-issued test on health precautions, prove they are free of tuberculosis and adhere to codes of conduct required of all other health care professionals in Hawaii, said Anna Paige, who runs Skin Deep Tattoo in Waikiki. Another measure pending in the Legislature would exempt native Hawaiian tattooing experts from tattoo licensing laws. Hawaiian tattooing uses pigment or scars to form body images, often using bones as their drawing tools. 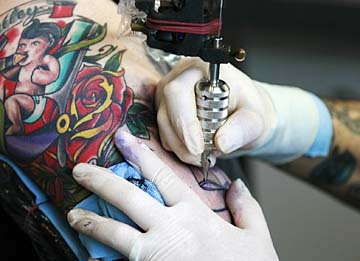 The state tattoo industry also opposes that measure because it wants it to include requirements to ensure the tools are sanitary, said Tricia Allen, of Tattoo Traditions.